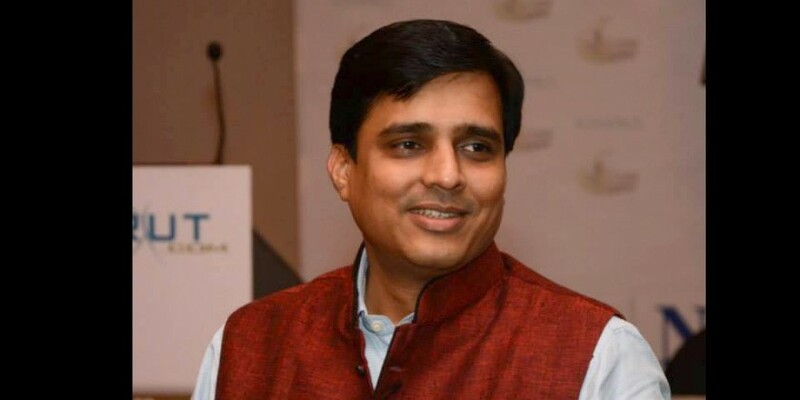 Road network in India, in all its vastness provides last mile connectivity to the masses and also proves to be an asset for the country, but the crammed highways chocking flow of goods have jabbed the Indian economy for long. Inconsequential planning and scruffy implementations from successive regimes in the past have gifted the country this messy drive plexus. Advances in automotive technology mean that a drunken driver safely belted in can often walk away from an accident. The pedestrians/two-wheelers/smaller vehicles that he/she hits may not be as lucky. 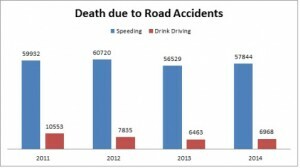 Madhya Pradesh and Bihar account for almost a quarter of all deaths due to drunk driving. Among smaller states, Haryana and Uttarakhand have tolls way higher than many larger states. Traffic police in major cities like Mumbai and Delhi have been conducting sustained campaigns against drunk driving in response to high-profile cases. Going by the numbers, such campaigns are particularly needed in Madhya Pradesh, Bihar, Haryana and Uttarakhand as well. In 2014, 30 percent of all road deaths were of riders/passengers on two-wheelers, while bicyclists accounted for three percent and pedestrians for nine percent. A study conducted by the World Health Organisation on road accidents suggests that wearing a helmet can reduce the risk of severe injury by 72 percent and the risk of death by 39 percent. However, wearing a helmet is mandatory only in a handful of Indian cities, and only for two-wheeler riders, not other passengers. Helmets are not mandatory for cyclists. India’s two-wheeler density is a fraction of other middle-income nations, such as Vietnam, Indonesia and Malaysia. 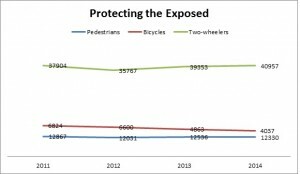 As India’s economy grows, so will the number of two-wheelers–and safety issues will have to be tackled. 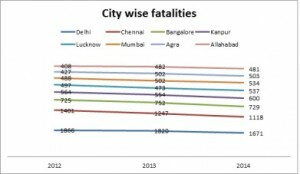 India’s fifty largest cities accounted for 16,611 road fatalities in 2014, with Delhi, Chennai and Bangalore taking the top three spots. Mumbai is another standout in terms of road safety; it has fewer road deaths compared to smaller cities like Chennai, Bangalore or Kanpur. This is because Mumbai has fewer vehicles on the roads in proportion to its population, as it has a reasonably efficient, albeit greatly overloaded, mass-transit system. The IT industry is known for its innovative, time saving, efficient solutions for a wide variety of challenges. Now it appears that the IT sector has woken up to another challenge. Communication systems between vehicles and infrastructure providers have the potential to revolutionize the transport sector. While “connected cars” (ie, vehicles enabled to communicate with infrastructure through embedded devices) have existed for several years, communication and cooperation between vehicles and connected transport-related infrastructures (such as traffic lights, parking lots, etc.) is a new phenomenon. By installing “V2X” communications (vehicle-to-vehicle and vehicle-to-infrastructure communications—basically a variant of WiFi) in vehicles, carmakers can interact directly with other vehicles and provide advanced applications by exploiting real-time data from vehicles and infrastructure. These systems can be used to improve road safety, traffic efficiency and passenger comfort. A cooperative connected car, for example, would receive not just information about a hazard detected by its own sensors (through a sound or vibration, which is more likely to catch the driver’s attention than a road sign), but also through alerts from a vehicle further along the road. V2X communications can also help to provide more real-time information about traffic hold-ups. Intelligent Speed Adaptation (ISA) can be developed for various vehicles by using GPS technology. The owner may get to know about exact location of his vehicle and what is the prescribed speed limit on the stretch of road it is moving, thus he may install a device (through a software or app.) of cutting the fuel flow the moment driver tries to exceed a speed limit making it physically impossible for the him to over speed. Technology has improved lives across the board and will continue to offer opportunities to develop better public transport systems. Traditional models of the inter-relationships between service planning, operations control and passenger information, have been based largely on the independence of these functions from one another. Getting drivers to adjust their speed to desired levels to accommodate other road users’ needs is an ongoing problem. Dynamic Speed Adaptation (DSA)technology offers remote speed advice to drivers about appropriate speeds in particular stretches of roadway and trials of it have already been conducted in Sweden and the Netherlands. Cameras of every kind are already proliferating at an incredible rate to measure speeds over long distances. CCTV cameras may be installed on all traffic signals where they may read number plates of the vehicles and instantly compare them to a National Database so illegal vehicles can be intercepted to bring criminals to a speedy justice. The global status report on road safety published earlier this year by the World Health Organization (WHO) stated that approximately 12 Lakh people die every year on the world’s roads and that 27 percent of all road traffic deaths are pedestrians and cyclists. However, the same report also suggests the countries who have implemented the first grade technologies have controlled the road rage deaths. Global experience shows that building safer motor vehicles and re-engineered road geometry does not translate into a better road safety record. There are success stories, like Sweden, where a “vision zero” approach to road safety was able to bring down fatalities to five or six annually. The US, on the other hand, managed to bring down the risk of road fatalities per kilometre travelled. However, the total kilometres travelled has grown exponentially in the past decades, hence total road traffic fatalities continue to be high. Rather than focusing on improving the safety of fast-moving vehicles, the international road safety discourse now focuses on two objectives: reducing the average speed of vehicles and, importantly, reducing the total volume of vehicle kilometres travelled. Together, this is known as a “sustainable transport approach” to road safety. It includes the redesign of urban streets and transport systems so that greater emphasis is put on public transport, non-motorized transport and transit-oriented development. The sustainable transport approach can also be categorized by the Avoid-Shift-Improve (ASI) framework, where the objective is: avoid growth in vehicle kilometres travelled; shift trips to safer and more sustainable modes, like public transport and non-motorized transport, and improve the general condition of transport in terms of safety, time, cost, comfort. 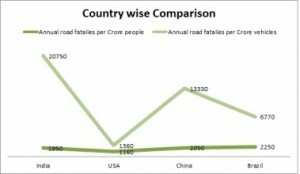 This means India needs a two-pronged approach to road safety, with an equal emphasis on reducing the risk of fatality per kilometre travelled and reducing the number of vehicle kilometres travelled. There is a critical list of best practices under each approach. Reducing the risk of fatality means strict enforcement of traffic rules — drunk driving, helmet use, seat belts and child restraint, as well as air bags. It means improving the behaviour of all road users: lane driving, keeping to speed limits, using and respecting pedestrian crossings etc. It also means improving road geometry — identifying accident-prone spots and re-engineering them. Finally, it means ensuring that the vehicles manufactured are safer. Governments and planners should require many of these standards by law, and by building a strong system for its enforcement. Reducing the number of vehicle kilometres travelled means increasing safe access to presently vulnerable road users — bicyclists and pedestrians. Planners should make access to urban streets safer through better design and adequate space for pedestrians and other non-motorised transport users. It also means encouraging alternate, preferably non-motorised, forms of transport, such as cycle rickshaws, for shorter or local commutes. The use of mass-transit systems such as buses and trains to assist long-distance commutes is strongly recommended. Planners should rationalize new road infrastructure investments by asking if it is a priority if only a small percentage of commuters own or drive cars. In Mumbai, for instance, just 14 per cent use private cars or two-wheelers, whereas the majority spend a large part of their commute as pedestrians or users of public transport. As is often repeated within the transport sector, a rich nation is not one in which the poor have cars but one in which the rich use public transport.